Almost all of us have been faced with the questioning of a child by repeating one word over and over. He can be very frustrating to us as he asks “Why?” If you put a knife beyond his reach, he wants to know, “Why?” When you explain it is sharp, he asks “Why?” And so you explain, “in order to cut fruit,” and he asks, “Why?” And so it goes. It illustrates the dilemma of applying reason. What we have to do when we apply reason is first to set standards of proof. We decide for ourselves, “What will be satisfied with if I find such and such and so and so that constitutes for me a final proof?”. We have to decide on that first. What happens though, is that on the really important issues, the philosophical matters, thinkers set standards of proof and they take a look at their subjects and eventually they may arrive at their standards. They may arrive at the point which they say would constitute a proof. But then they ask for a proof of the proof. The key to avoiding an endless dissatisfaction is to satisfy ourselves about standards first; to satisfy ourselves that such and such are a list of criteria that constitute proof, satisfying proof, and then we test the subjects that we examine. In particular I will apply this to the Qur’an. Ask a thoughtful Christian why he is a Christian, and he will usually reply, “The miracle of the Resurrection.” The basis for his belief being that about two thousand years ago a man died and he was raised from the dead. That is his miracle, his “touchstone”, because all else depends on that. Ask a Muslim, “Well, what is your miracle? Why are you a Muslim? Where is your miracle?” and the Muslim can go over and take his miracle off the shelf and hand it over to you because his miracle is still with us today. It is the Qur’an; it is his “touchstone”. While all the prophets have their signs, Moses had the competition with the magicians and the Pharaoh, Jesus healed the sick and raised the dead and so on, one Sign was given to the last of the prophets. According to the Muslims, this is the Qur’an. And this one Sign is still with us. Does not that after all seem fair, that if prophethood is to end that the last prophet should bring something that stays with us so that, in fact, a Muslim who takes his religion seriously suffers no disadvantage to Muslims who lived fourteen centuries ago? Those people who kept company with the Prophet had access to no more of the necessary information than we have today. They had the Qur’an. That was the sign for them. It is still a sign to us today, the same miracle. Well, let us test the Qur’an. Suppose that if I say to a man, “I know your father.” Probably he is going to examine the situation and see if it seems likely that I have met his father. If he is not convinced, he will start asking me questions like: “You know my father, you say, is he a tall man? Does he have curly hair? Does he wear glasses?,” and so on. If 1 keep giving him the right answers to all these questions, pretty soon he is going to be convinced. “Well, I guess this man did meet my father like he said.” You see the method. Have not the disbelievers seen that the Heavens and the Earth were one piece and we parted them? And We made every living thing from water. Will they not then believe? (21:30). There are three key points here. First of all, it is the disbelievers who are mentioned as being those who would see that the heavens and the earth were one piece and then parted and would see that all life came to be made from water. As it happens, the universally accepted theory of the origin of the universe is now the Big Bang theory. It maintains that at one time all of the heavens and the earth were one piece, the monoblock as it is called. At a particular point in time, this “monoblock” burst and it continues to expand. This gives us the universe we have today. This was a recent discovery, a recent comfirmation. “Have not the disbelievers seen that the heavens and the earth were one piece and We parted them? And We made every living thing from water. Will They not then believe?” (21:30). Everyone must be committed to something. You have to put your foot down some place. It is impossible to be neutral at all times. There has to be a point of reference in the life of any thinking individual. You have to take a stand somewhere. The question, of course, is to put your foot down in the right place. Since there is no such thing as a proof of a proof of a proof and so on, in order to find the right place to put one”s foot down, to take a stand, we have to search and find that place and it is by a method that I hope to illustrate here. It is a question of finding a point of convergence. You see, we search for truth in many places and we begin to know that we are succeeding in finding the truth if all our different paths start to converge; they start to come together at the same point. If we are examining a book, looking for evidence of divine origin, and we are led to Islam, this is one path. If at the same time, we are examining the words of all those who were called prophets and we find ourselves led to Islam, we have a firmly grounded basis for belief We started looking for truth in two different places and found ourselves going down the path headed for the same destination. No one ever proves all things. We have to stop at some point being satisfied with our standards as I have mentioned earlier. The point is, in order to take a stand and to be sure it is in the right place, we want to examine all the evidence around us and see where does it lead us and anticipate this point of convergence; to say it looks like all things are pointing to this place. We go to that place and then look at the data around us to see if it fits into place. Does it now make sense? Are we standing is on right place? Let me first show more of our examination of the Qur’an, and then an examination of some words of prophets to find this point of convergence. In chapter fifty one, verse forty seven, it is mentioned that the heavens are expanding. As I mentioned earlier, this is in connection with the “Big Bang” origin of the universe, as it is usually called, and it was in 1973 that the Nobel prize was awarded to three men who were confirming that, after all, the universe is expanding. The Qur’an mentions a city by the name of Iram (89:7). The city of Iram has been unknown to history, so unknown that even some Muslim commentators, out of embarrassment or feeling apologetic for their religion, have commented on this mention of the city in the Qur’an as being perhaps figurative, that Iram was possibly a man and not a city. In 1973 the excavation in Syria at the site of the ancient city of Eblus uncovered the largest collection of cuneiform writings on clay tablets ever assembled. In fact, the library discovered in Eblus contains more day tablets that are more than four thousand years old than all the other tablets combined from all the other sites. Interestingly enough, you will find the details in the National Geographic of December 1978 (pp.730- , esp. p.736) which confirms that in those tablets the city of Iram is mentioned. The people of Eblus used to do business with the people of Iram. So here in 1973, comes confirmation of the fact that, after all, there really was an ancient city by that name, wherever it was. How did it find its way into the Qur’an, we might ask? Those Muslims who may have offered their comments, trying to explain away this reference that they were uncomfortable with, were outsmarted by the author of the Qur’an. They are those who would outsmart the author of the Qur’an They would attempt it. Primarily, their activity would involve trying to produce the evidence that the author of this book had a primitive understanding of the world around us. For example, there is a word which is translated today usually in Arabic as zarrah. This is usually translated as “atom” and it is usually thought of in Arabic as being the smallest item available at one time. Perhaps the Arabs thought it was an ant or a grain of dust. Today the word is usually translated as “atom”. Those who would outsmart the author of the Qur’an have insisted that, well, the atom is not after all the smallest piece of matter because in this century it has been discovered that even the atom is made of still smaller pieces of matter. Is it then possible to outsmart the author who chose to use this word? Well, there is an interesting verse, in chapter ten, verse sixty one, which speaks of items the size of a zarrah, (atom) or smaller. There is no possibility that on this subject someone is going to say a new discovery has outdated the words of the Qur’an on the issue of the size of matter or the ultimate particles. The verse talks about items the size of a zarrah (atom) or smaller. Speaking of outsmarting the author of the Qur’an, the Islamic point of view is that when a man embraces Islam, his past is forgiven from the very beginning. This has been the invitation to Islam: come to Islam and all is forgiven from the past. But consider this. There is only one enemy of Muhammad, peace be upon him, who is mentioned by name in the Qur’an: one Abu Lahab. In a short chapter of this book, he is condemned to punishment for his sins. He could have confused them so much as to finish this small movement because he would have been pointing out to them that they were now in confusion. The policy was instant forgiveness of the past but their own revealed scripture announced that he was not forgiven. As it was, Abu Lahab died without accepting Islam. In fact, the Qur’an confidently predicted a number of things only a few years before they came to pass. The fall of the Persian empire, for example, was predicted in spite of the fact that it had just suffered a serious military reverse. The evidence was all to the contrary. But in the chapter entitled Rom, the fall of the Persian empire who were recently victors over the Romans was predicted. When all the Muslims in the world could meet in one room, the revelations were already discussing their future successes. In confidence, they were planning for the day when they would be in charge of the city where they were forced at that time to hide for their very lives. We all know something that we can be confident of, and if we can turn to the Qur’an to read what it says about this subject, we are asking for confirmation of our belief in the Divine origin of the book. A friend of mine from the University of Toronto, had the experience of dealing with a man who was doing his doctorate in psychology. He chose as his subject: “The Efficiency of Group Discussion”. He suggested a number of criteria as to what constitutes an efficient discussion. He graphed the process; that is, he achieved a measure of the efficiency of all groups in their discussions according to an index by his system. On his graph he indicated the progress made by the discussion groups of various sizes. The interesting thing that happened which he did not expect to find when he began his project was that, while there were some differences between the size of any given group and how well they did in discussions, he was surprised to find that groups of two were completely off his scale. In other words, when two people sit down to discuss something, they were so much more efficient than any other size of group that it went completely off his scale of measurement. When my friend heard about this, something went on at the back of his mind. My friend, being a Muslim, thought there was something familiar here about this idea. The psychology researcher was not a Muslim. He was debating with himself on changing the topic of his thesis. Should he call it “Ihe Phenomenon of Two” or “The Two Phenomena”? He was so surprised at his discovery. Meanwhile, my friend found that there is a verse in the Qur’an, and he found it for himself on the same night, which speaks on discussions and the size of groups and how efficient they are. And maybe we should not be surprised to find that it is the groups that are two in numbers that do the best in achieving results. The verse in the Qur’an reads, concerning discussion groups, that when discussing the Qur’an one should sit alone and reflect on its meaning or discuss it in groups of two. 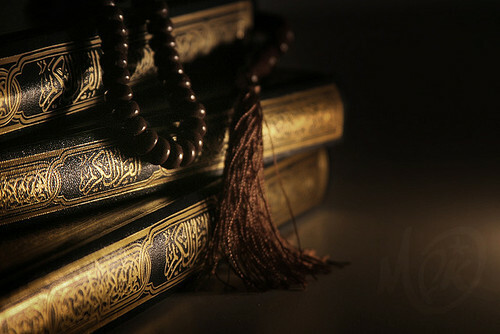 Which tells me that there are no wasted words in the Qur’an; that each verse is perfected and then it is explained. It could not be in a better form. One could not use fewer words to say the same thing or if one uses more words one would only be adding superfluous information. This directed my attention to a particular mathematical subject, a logical subject, and I examined the Quran to see if I could find something of what I knew to be the case. A revolution in logic has occurred in the last one hundred years, primarily over the difference between use and mention of words. A structure of logic seemed to be in danger of collapsing about a hundred years ago because it came to the attention of the people who studied these matters that the structure was not quite sound. The issue involved “self-reference” and the use and the mention of words which I will explain briefly. Aristotle”s law of the “excluded middle” was the statement that every statement is either true or false. About a hundred years ago, somebody pointed out that the law of the excluded middle is a statement and is therefore not a law after all. It could just as well be false as well as true. This was a tangled knot for the logicians to untie until they came to understand the difference between the use and the mention of a word. When we use a word, we consider its meaning. When we mention a word we are discussing the word itself. If I say Toronto is a large city, I mean Toronto, that place, is a large city. If I say Toronto has seven letters, I am talking about the word “Toronto”. In the first case I used the word and in the second I mentioned the word. You see the distinction. It is very clear that what we have in this statement is an equation. This verse goes on to explain how that is true because they both came under unusual circumstances rather than having a mother and a father in the usual human reproductive way. But more than that, 1 got to considering the use of the mention of words. The words are used clearly enough. Jesus is like Adam and by Jesus and Adam, we mean those two men. But what about the mention of the words? Was the author aware of the fact that if we were considering the words as words in themselves, this sentence also reads that “Jesus” is somehow like “Adam”. Well, they are not spelt with the same letters; how can they be alike in this revelation? The only answer came to me fairly quickly and I took a look at the index of the Qur’an. The index of the Qur’an has been made available only since 1945. This book was the result of years of work by a man and his students who assembled a book which lists every word in the Qur’an and where it can be found. Well, the phrase in Arabic for “the people who reject our signs” could be found in the Qur’an exactly five times. And so is the Arabic word for “the dog” (al-kalb). And there are several instances of exactly the same occurrence. It was some months after I found this for myself that a friend of mine, who is continuing this investigation with me, made a suggestion that there are also some places in the Qur’an where one thing is said to be not like another thing. As soon as he mentioned this up to me, we both went for the index and had a quick look at several places where one thing is said to be not like another thing and counted their occurrence in the Qur an. We were surprised and maybe should not have been to find that, after all, they do not match up. But an interesting thing does happen. For example, the Qur’an makes it very clear in the verse that trade is not like interest. The two words will be found six times for one and seven for the other. And so it is in every other case. When one thing is said to be not like another, they occur for a difference of one time. It would be five of one and four of the other, or seven of one and eight of another. Well, I had a look at those two words in Arabic, the evil and the good, and found it in the Qur’an that they both occur seven times. Yet the verse here is saying that they are not comparable. I should not expect to find that they occur the same number of times. But what does the rest of this verse say? Here is the solution to the difficulty. While we have seven occurrences of al-khabeeth (the evil) which matches up with the occurrences of al-taib (the good), according to the principle of this verse, evil is separated from good and is piled one on top of the other and heaped all together. We do not count them as seven separate instances. A favourite difficulty, or supposed difficulty, which critics like to cite or have cited in the past years concerning the Qur’an is that, apparently to their thinking, the author of this book was ignorant because he advised the Muslims to follow the lunar year instead of the solar year. The critics say the author was unaware of the difference in the length of years, that if one follows twelve lunar months one loses eleven days every year. The author of the Qur’an was well aware of the distinction between the length of the solar year and the lunar year. In chapter eighteen, verse nine it mentions three-hundred years and gives their equivalent as three-hundred and nine years. As it happens, three-hundred solar years is equal to three-hundred and nine lunar years. Let us go back to my original scheme of the occurrence of words in the Qur’an. The Arabic word for “month”, shahar, will be found twelve times in the Qur’an. There are twelve months in a year. If we find twelve months, how many days should we expect to find? The word in Arabic is yaum, and as it happens you will find that the word occurs three-hundred and sixty-five times in the Qur’an. As a matter of fact, the original issue which had me interested in looking up the occurrence of months and days was this distinction between the solar year and the lunar year. Well, for twenty-five centuries it has been known that the relative positions of the sun, moon and earth coincide every nineteen years. This was discovered by a Greek by the name of Meton, and it is called the Metoniccycle. Knowing this, I looked again to the index for the word “year”, sanah, and found, sure enough, that it occurs, in the Qur’an nineteen times. Now, what is the point of this perfect balance of words? For myself, it shows the author was well aware of the distinction between using words and mentioning words, a fine logical point. But more than that, it indicates the preservation of this book. After giving a lecture on the subject of the Qur’an, I touched on some of these subjects and a questionnaire from the audience afterwards said: “How do we know we still have the original Qur’an. Maybe pieces of it have been lost or extra parts been added?” I pointed out to him that we had pretty well covered that point because since these items, the perfect balance of words in the Qur’an, have come to light only in this generation, anybody who would have lost the portion of the book, hidden some of it or added some of their own would have been unaware of this carefully hidden code in the book. They would have destroyed this perfect balance. It is interesting to note too that, well, such a thing might be possible to organise today by the use of a computer to coordinate all words so that whatever thought you might have as to a meaning of a sentence or however you might construe an equation out of a sentence, you could check for yourself and the book will always have the balance of words. If that were possible today, if it were possible fourteen centuries ago, why would it be done and then left hidden and never drawn to the attention of those who first saw this book? Why it would be left with the hope of the author who contrive this, that maybe in many centuries someone will discover it and have a nice surprise? It is a scheme that does not make sense. We looked again to the index of the Qur’an and we found that the word, qalu (they say), is found three-hundred and thirty-two times. Now, what would be the natural counterpart? The Arabic word, qul, which is the command “say” and you will find at the index it also occurs three-hundred and thirty-two times. An interesting feature of the Qur’an is that it replies to its critics as to its origin. That is, no one has yet come up with a suggestion as to where this book came from which is not commented on within the book itself. In fact, the new Catholic Encyclopedia, under the heading @an, mentions that over the centuries there had been many theories as to where this book came from. Their conclusion: today, no sensible person believes any of these theories. This leaves the Christians in some difficulty. You see, all the theories suggested so far, according to this encyclopedia, are not really acceptable to anyone sensible today. They are too fantastic. Where did the book come from? Those who have not really examined the Qur’an usually dismissed it as being, as they say, a collection of proverbs or aphorisms, sayings that one man used to announce from time to time. They imagined that there was a man who, from time to time during the day, will think of some witty little sayings and spit it out and those around him will quickly write it down and eventually these were all collected and became the Qur’an. Those who read the Qur’an will find that it is not anything like that at all. The collection of things said by the Prophet is the subject and the content of the Hadith. But the subjects and contents of the Qur’an are all in a form of a composition and explanation. I cite as an example the chapter, Yusuf, which is an entire story in great detail about one particular episode or one portion of the life of one man. It is a composition. It is for this reason that virtually all those who have actually examined the Qur’an usually refer to it as being the product of the authorship as attributed to Muhammad and his “co-adjudicators”. These were supposed to be people who would sit, with him and composed the Qur’an. You see, they imagined that the Qur’an was composed by a committee. “Say, now the truth has come, and falsehood neither invents anything nor restores anything.” (34:49). It is hard to translate it into English precisely, but what this verse is telling us is that falsehood is not the source of a new thing. A new and truthful thing cannot come from falsehood and falsehood does not restore, to our minds, the facts. Truth is in agreement with facts. Falsehood is something else. So, falsehood is empty. If something is born in fraud, it will never bring us new information. It will never endure; it will only collapse over a period of time. Here is a challenge to the reader. If you think you have an explanation where this book came from, have another look at the book. Surely you will be able to uncover some inconsistencies to support your case. There are critics who make the attempt, critics who try to say the Qur’an contains inconsistencies. A publication that came to my attention recently suggested that the Quran was contradictory on the subject of marriage, because in one place, it says: “Don”t marry more than one wife unless you can provide for them all,” and in another place it says: “Don”t marry more than four.” They see this as a contradiction. What they have is a counter-distinction. In one case, the qualification for marrying more than one has been given. In the other case, a limitation on how many may be married is given. There is no contradiction. Critics are too quick to grab hold of something, give it an interpretation, and then offer it as an excuse to escape the reality of this document. For critics who would attack the Qur’an and insist it contains mistakes, we can use the same method as in our reply to Christians who claim that Jesus is on record as claiming to be equal to God. Remember the three categories of evidence offered. The evidence offered was insufficient, ambiguous or impossible. You see, if someone cites a verse from the Qur’an, trying to show that it is a mistake, we only need to show that the verse cited is insufficient to establish that there is a mistake or we need to show that the verse cited has other meanings than the one given by the critic or we can demonstrate that the verse cited cannot possibly have the interpretation which the critic is giving it. It will always fall into one of these three categories. The Qur’an comments on this suggestion in chapter twenty-six, verse two-hundred and elevm as to those who would suggest that the book came from the devil. It points out that it does not quite suit him, does it? Is this how the devil misleads people? He tells them, worship none but God, he insists that they fast, that they practice charity. Is this how the devil misleads people? Compare the attitude of someone like this, to the attitude of the Jews who knew Jesus and opposed him until the very end. There is an episode reported in the Bible where Jesus raised a man from the dead, one Lazarus, who had been dead for four days. When Lazarus came out of the tomb, alive again, those Jews who were watching what did they do? Did they suddenly say that this man is a true prophet and become believers? No, the Bible says they immediately discussed among themselves that “since this man is working on his signs soon everyone will believe in him. We”ve got to find a way to kill him,” and they attributed his miraculous powers to the devil. He raised that man by the power of the devil. There are those who insist that the Qur’an was copied, that it originated in Christian and Jewish sources. As a matter of fact, a book published in recent years called Worshipping the Wrong God has stated, as though it were a fact, that after the first revelation of the Qur’an came to Muhammad, peace be upon him, that his wife died and so he quickly married a Jew and a Christian, and this is where he drew the rest of his sources for his book. Well, they have the facts partly right. It was ten years after the first revelation of the Qur’an that his wife died, and it was another ten years after that when the Qur’an was virtually completed that he married a Jew and a Christian. Did he copy from Jewish and Christian sources? In the Qur’an, the ruler of Egypt who opposed Moses is known as Fir’aun, not Pharaoh. The Jews and Christians have always said “Pharaoh”. It is easy for an Arab to say “Pharaoh”. But in the Qur’an, it is Fir’aun, with an “n”. Why? Surely the Jews and the Christians who surrounded the Muslim community must have teased them about that and said: “You”ve got the word wrong. It”s “Pharaoh” and not Fir’aun.” But they insisted on it and it continues that way in the Qur’an, Fir’aun. As it happens, the historical writings of Herodotus, the Greek historian, e)dst to this day, and Herodotus conunents on the ruler of Egypt, being in his day and in the centuries before him, one man who went by the title of Fir’aun. Did the book copy from the Christian sources? The Qur’an insists that Jesus was not crucified, that this was only an illusion, but that the Jews who thought they crucified Jesus were mistaken because it was not really so. Christians would have no part of that. As it happens, the idea that Jesus was not really crucified is really very ancient and can be traced back to the first century. But Christians who believed that were eliminated as heretics within the first two-hundred years after the time of Jesus and they were not teachin this doctrine anywhere around the Arabian Peninsula fourteen centuries ago. The Muslims recognise this very quickly because the Ka”abah, the building which all Muslims face in prayers everyday, was at one time filled with idols and it was part of the mission of Muhammad, peace be upon him, to purge the house of idols. They were destroyed and the house sits there cleansed of idols till today. It was in the next generation, after the time of the Prophet that the wise men of Persia and others did join his followers. In the Bible, in Deuteronomy chapter eighteen, we have the words of Moses who reports that God told him that He would raise up a prophet, from among the brothers of the Israelites, like Moses. Christians wish to apply this to Jesus, to say he was the prophet like Moses. It is uncomfortable for them to recognise, however, that Jesus was not very much like Moses and Jesus had no father, no wife, no children; he did not die of old age, and he did not lead a nation; all these things Moses had or did. But they say, well, Jesus will return; he will return as a victorious person, and so he will be more like Moses. Do they really expect he will return to also acquire a father and a wife and children and then die of old age? Not usually. Moreover, Jesus was an Israelite. The passage of scripture says that this prophet that was foretold would be raised up among the brothers of the Israelites, not from the Israelites. In the third chapter of Acts, the disciple Peter speaks to a crowd of people and explains that Jesus has been taken up and he is in heaven. He will remain in Heaven and he cannot return until all the things that were promised by God come to pass. So what are we still waiting for, does he tell the crowd? He quotes this very saying of Moses, saying. The point is very clear. Christians like to see this prophet as being Jesus. But read carefully Acts chapter three, what it says is that Jesus awaits a return. He cannot return until the fulfilment of this prophecy, that another prophet has to come. Jesus spoke of it himself and the words survived, just barely, but they survived in the Bible. Jesus spoke of God sending another “Paraclete”. There is a lot of argument over the meaning of this word “Paraclete”. For now we can leave that aside. What is a “Paraclete”? It does not matter. The first letter of John shows that Jesus was a “Paraclete”. He is called a “Paraclete” and we have Jesus promising another “Paraclete” is going to be sent. We lose a lot by this word “another” in English because it is ambiguous. If someone”s car breaks down, and it is a Toyota, and I say, “I’II go and get you another car,” maybe I mean, “I’II go and get you another Toyota because this one you have is broken,” or maybe I mean, “Forget Toyota, they’re no good; I’II go and get you a Datsun.” It is an ambiguous word. But the Greeks had a word for it. When they meant “another” of the same kind, they said aloes. When they meant another of a different kind, they said heteroes. The important thing here is that, when Jesus, who was himself a Paraclete, said “God will send you another Paraclete” he used the word aloes, not heteroes. Christians want to say that this other “Paraclete” that has been sent was different from Jesus. It was not a man, it was a spirit. What Jesus said was: “God will send you another one like me, another man.” Muslims believe that Muhammad is the fulfilment of this prophecy by Jesus. The Qur’an says that this man is mentioned in the scriptures of the Jews and the Christians (see 7:157). Christians came to expect the return of Jesus because of a Jewish misunderstanding. “Messiah” and “Son of Man” have been given special significance by the Jews, even though many people were called by this same name as in the Bible. The Jews came to expect a victorious leader. When Jesus did not turn out to be quite what many expected, they hatched the idea that he would return some day and fulfill all these prophecies. Suppose that someone observed Jesus two-thousand years ago, and he left this planet, or he went to sleep for two-thousand years and returned today to look for the followers of Jesus, who would he find? Who would he recognise? Christians? I conclude with just this food for thought: the Bible says very clearly that Jesus used to fast. Do Christians fast? Muslims fast; it is obligatory one month every year. The Bible says that Jesus prayed by touching his forehead to the ground. Do Christians pray in this manner? Muslims do. It is characteristic of their prayer and no one on earth is probably ignorant of that fact. According to Jesus, he told his disciples to greet one another with the expression, “Peace be with you.” Do the Christians do that? Muslims do, universally, whether they speak Arabic or not. The greeting for one to another is Assalamu’alaikum (peace be with you). These conclude my thoughts on this subject. May Allah guide us always closer to the truth.